Exciting things are happening at the Friends in Need Food Shelf! 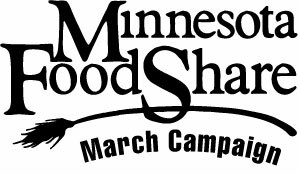 The Minnesota FoodShare March Campaign happens in March. The money and food that we receive during the month of March are partially matched by Minnesota FoodShare, which is a part of the Greater Minneapolis Council of Churches. As most of you know, money is always best as we purchase most of our food from Second Harvest. If you would like to send a check, please mail it to Friends in Need, P.O. Box 6, Cottage Grove, MN 55016. If you would prefer to make an online donation, please go to our Donate page and you can give through your PayPal account or your credit card (processed by PayPal.) If you would like to do a drive in March, we would encourage you to consider toiletry items such as toilet paper, bar soap, shampoo, paper towels, deodorant, feminine hygiene products, dish soap and large-size diapers as these are items we really need. We continue to offer wonderful fresh produce to our clients, even during the winter months. We purchase some fruits and vegetables each month and we get rescue produce from Walmart, Target and Second Harvest. (During the growing season, we are grateful to receive fresh produce donations from Guardian Angels Church, the Newport Community Garden and the St. Paul Park Community Garden!) We also provide milk, eggs, deli and meat to our clients along with non-perishables and toiletries. Giving out healthy food has been a high priority for us. This past year, we served over 28,000 people (duplicated number as families are counted each time they are served). The reason we are extremely successful is that we are supported so generously by the community around us. Our local businesses, civic organizations, schools and churches are amazing! With the amazing support or the St. Paul Park Refining Company and the generosity of our donors, we are able to keep up with the demand and allow our clients to come in every other week. We couldn’t do this without you!